How To Send A Video Message To Friends Using Windows Live Messenger? Windows Live Messenger has a neat feature using which you can send short video messages to your friends just as you would send a short text message. The video messages are 30 seconds in length and can be recorded any number of times before you send them across to your friends. 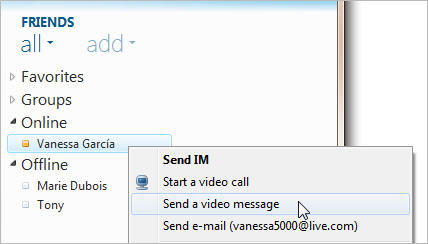 In this article we will tell you how to go about sending video messages to your friends using Windows live Messenger. If you have not downloaded the latest versions of Windows Live Messenger on your computer, then you should see this. Step 1: After you have installed Windows Live Messenger, sign-in into your Windows Live Messenger account. Step 3: You can now see the record video dialog box. Once you are ready, click the red Record button. You can record messages which can be up to 30 seconds long. Step 4: To review your video, click the blue Play button. If you think the video you just recorded is good, click Send else you can click on the Record button again to record a new message.